The book is called 101 Greatest Magic Secrets Exposed, authored by a Mr. Herbert L. Becker. A Christmas gift by a distant relative that was given with the best of intentions yet still missed the mark by quite a wide margin. It sits here on the table beside me, shiny and new, several of its pages still sticking together from lack of handling. If I turn the book over I can still see a section of wrapping paper, evidence that I got only as far as taking at look at the cover before thanking the giver for the thoughtful gift and setting it aside. To him (or her), it was the perfect present. I like books, and I like magic. But I’m not reading it. No way. I say I like magic, but that’s not quite the correct word. 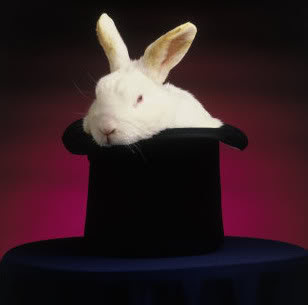 I love magic. Can’t do it of course, unless you count marveling a bunch of preschoolers with the old Hide Something Behind Your Back trick. But I love to see it done. Professionally or otherwise. It doesn’t have to be anything so extravagant as to involve tigers or disappearing airplanes. In fact, the smaller the magic the more it appeals to me. I love the agility, the misdirection. I love the showmanship. Yes, it’s all just a trick. All an elaborate sham of skillful legerdemain. I know this going in. And it matters not. All that matters to me is that I remain ignorant of the means by which that magic is done. I don’t want to know those secrets of where the rabbit is before it’s pulled out of the hat or how the buxom brunette is put together after being sawn into. Knowing would rob me of my wonder. And that’s exactly what magic is all about. I’ve spent much of my life searching for answers to the questions that preyed on my mind. Big questions. Important ones. Like how can I find love and why does everyone have to hurt and why God sometimes just doesn’t seem to care and what does it all mean anyway. I talked to giants of both faith and the mind, read countless books, prayed and meditated. And do you know what I got out of that? I did acquire a head full of knowledge and theories, many of which contradicted either one another or reality. But that was okay at the time, because I believed I had much more than when I began. I had facts. And when it came to understanding this world and the life we live in it, facts seemed to be the most important things I could possess. Unfortunately, those facts didn’t carry me far. They were a weighty spade to plunge into the hardpan of my life, cracking the surface of my doubts and questions to water that arid ground with the elixir of truth. But those questions did not yield. The head of the spade held true, but the handle, that part where flesh met iron, could not hold. I had learned that tears were drops of salty fluid secreted by the lacrimal gland to lubricate the eyeball, but that did little to explain why I shed so many of them. That death was to stop living. I learned, too, that a rainbow was formed by the refraction, reflection, and dispersion of light in rain or fog. Those were the facts. But those facts did little to explain why I shed so many tears and why people had to die. And somehow knowing the facts behind a rainbow made it less beautiful to me, as if it were more of a process and less of a miracle. Sometimes ignorance really is bliss, and there’s nothing wrong with that. We don’t have to know everything. Our task is the search for truth, yes. But the truth is that there are some things we are simply not supposed to understand. We’re not supposed to know everything. And because of that there is beauty to our unanswered questions and a sweet mystery to our doubts. There is magic in this world. I’m convinced of it. It flows not from the hands of a skillful conjurer, but from us. From our very being. We are surrounded by every day by enchantment so thick we almost must brush it from our faces. I won’t return this book. It will remain unopened but in a predominant place here on my table. It will be a reminder that knowing with the head is much different than knowing with the heart. And that given the choice, I will take possibility over fact any day.